5" FLO-THRU Jet Swet tool has a 3/4" hole down the middle of it with a hose connection at the end of the tool. This allows the user to work in systems where the main water shut off is by-passing water and continually putting pressure into the system. 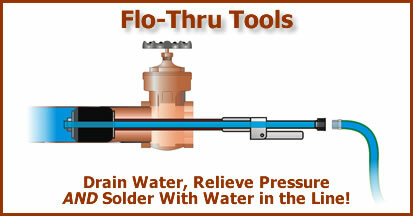 The by-passed water flows through the Jet Swet and down the hose away from the soldering area.